› Author Affiliations Funding This study was partially supported by the National Key R&D Program (2017YFC1308401), the National Natural Science Foundation (81371289) and the Project of Beijing Municipal Top Talent of Healthy Work (2014–2-015) of China. The funding agencies had no role in the design and conduct of the study; in the collection, analysis and interpretation of the data; or in the preparation, review or approval of the manuscript. Recently, internal jugular vein stenosis (IJVS) is gaining increasing attention from clinical researchers due to a series of confounding symptoms that impair the quality of life in affected individuals but cannot be explained by other well-established causes. In this study, we aimed to elucidate the clinical features, neuroimaging characteristics and pathogenesis of IJVS, and explore their possible correlations, in attempt to provide useful clues for clinical diagnosis and treatment. 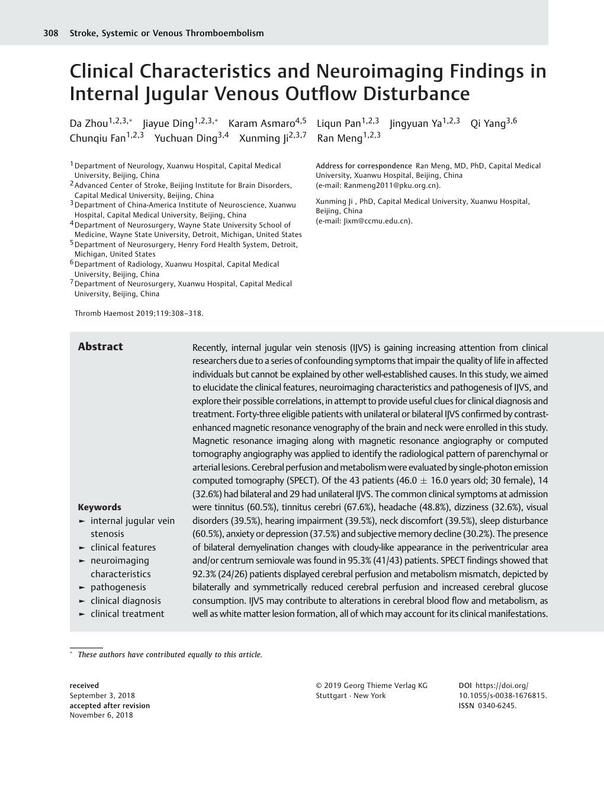 Forty-three eligible patients with unilateral or bilateral IJVS confirmed by contrast-enhanced magnetic resonance venography of the brain and neck were enrolled in this study. Magnetic resonance imaging along with magnetic resonance angiography or computed tomography angiography was applied to identify the radiological pattern of parenchymal or arterial lesions. Cerebral perfusion and metabolism were evaluated by single-photon emission computed tomography (SPECT). Of the 43 patients (46.0 ± 16.0 years old; 30 female), 14 (32.6%) had bilateral and 29 had unilateral IJVS. The common clinical symptoms at admission were tinnitus (60.5%), tinnitus cerebri (67.6%), headache (48.8%), dizziness (32.6%), visual disorders (39.5%), hearing impairment (39.5%), neck discomfort (39.5%), sleep disturbance (60.5%), anxiety or depression (37.5%) and subjective memory decline (30.2%). The presence of bilateral demyelination changes with cloudy-like appearance in the periventricular area and/or centrum semiovale was found in 95.3% (41/43) patients. SPECT findings showed that 92.3% (24/26) patients displayed cerebral perfusion and metabolism mismatch, depicted by bilaterally and symmetrically reduced cerebral perfusion and increased cerebral glucose consumption. IJVS may contribute to alterations in cerebral blood flow and metabolism, as well as white matter lesion formation, all of which may account for its clinical manifestations. * These authors have contributed equally to this article.